That is SO SO adorable! Love it! Great job on your cupcake tower! Yummy! Love the colors, ribbon and Stickles. So cute. Very Very Cute! Love the Cupcake Tower Idea! Is there a trick to inking up the backgrounds on the Cuttlebug...you know the raised background part? I try it and every single time I try to use my ink pad and drag it across the raised part, I always end up getting some on the "nonraised" part...Any tips?? Thanks Kendra! Super cute! Looks delish! Just love that sparkly candle. Love the card! You do such nice work! This is so yummy! Great colors and masking. You're right about Hambo stamps, I have a huge wish list now thanks to you!! This is a great card. 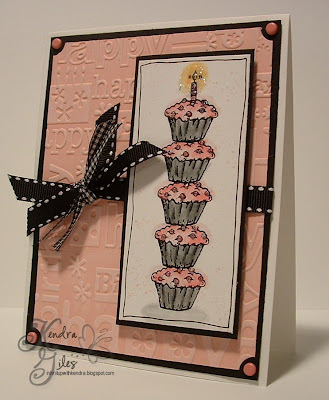 Love the way you did the cupcake stamp. Hey Girly. This is such a cute card. I love the way you stacked the cupcakes and the doodling around the image is great. Love this...those cute cupcakes look so yummy! My daughter was just asking me yesterday if she could have those cupcakes that you bake in an ice cream cone for her birthday in May. Remember those? How fun! The kids can ice them and sprinkle ém however. Sounds fun. Great card...oh, and BTW...LOVE your new name thingy about "about me" with those cute flowers!! Chocolate and Cool Caribbean are a favorite of mine. A very 'sweet' card, Kendra. I've linked to your blog on mine. Come by for a visit at www.barbscardcreations.blogspot.com I get lots of inspiration from you and the others I visit. Love this card Kendra! What a fun idea stacking those cupcakes...I just love it! I just came across your blog and I love it! You do some amazing work! I linked you to my blog and subscribed so I can see what you are up to. You seriously do some amazing work!!! SOOOO cute! I love your cards! I am new to the blogging world and it has been so much fun!